The ProAc K6 is one of our most successful designs and the plans to make a larger K8 have finally come to fruition. 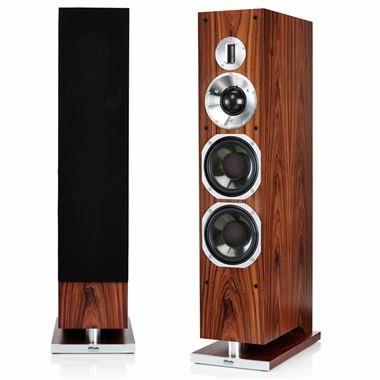 With a new wider cabinet, the midrange horn could now be redesigned. Stewart Tyler decided to make a very shallow midrange horn from billet aluminium. The midrange horn being very shallow gives excellent dispersion this widens the sound stage and reveals details right down to the finest brushed cymbal. The ProAc ribbon tweeter is also used as it is in most of ProAc's high end speakers. The tweeters are wonderfully natural and fine detail is produced even at high levels with comfort. The 8 inch Kevlar bass drivers are made in house these bass drivers are ported through a curved tude in the base of the loudspeaker. On extensive listening tests it was noticed that the K8 had a wonderfully wide sound stage and image, mainly down to our new shallow horn. Also new was the crossover and a new board was designed with heavy tracking and only audio file components along with studio quality inductors. The K8 is designed for those wishing to have a speaker from the top of the tree in terms of sound and build quality, this new design has produced a very large sound stage and along with clean and extended bass response and finished with our ribbon tweeter, I'm sure you will agree that their sounds are perfectly natural. Bass Driver 2 x 8 inch studio professional drive units with polymer impregnated and polished Kevlar weave cones, with rear lacquer and concentric weighting. Midrange Driver 3 inch studio professional soft dome loaded with our new billet aluminium wide dispersion horn. Tweeter ProAc ribbon with diaphragm as 'light as a human hair' alnico magnet and rear chamber damping. Crossover Finest components on dedicated circuit board. ProAc multistrand oxygen-free copper cable throughout split for optional bi wiring and bi amping. Weight 154.5lb (70Kg) each unpacked.